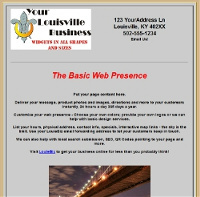 Web services and other resources for Louisville, Kentucky area businesses. The perfect way to get your business online. LouieBiz offers numerous online products, services and resources to help Louisville area businesses thrive in the digital age. From a single page web presence to larger sites and email addresses, LouieBiz can get you up and running on the World Wide Web for less than you think! Details on some of our services are below. Ready to get online or still need more information? Contact us today! Customize your Basic Web Presence with your own color scheme, logo, photos and more. Looking for a little more pizazz for your page? Check out the Enhanced Web Presence below. Customize your Enhanced Web Presence with your own color scheme, background design, logo, photos and more. If one page isn’t a big enough piece of online real estate for your business, then a LouieBiz Small Site may be the answer for you. Built with the same attractive styling of the Enhanced Web Presence but with more pages (up to three), LouieBiz Small Sites give you more space to share your message with current and potential customers and answer your frequently asked questions 24/7 without having to answer the phone or emails. Need a bigger, more elaborate site or access to make your own changes? Check out Walker Consulting Solutions. Communicating with your customers, clients, and leads using an email address from a free email service, especially on first contact, can give a less-than-professional impression. Distinguish yourself as a Derby City business pro with your own yourname@LouieBiz.com email address. 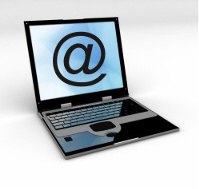 Email addresses – available with or without the purchase of a website package – can be set up as a forwarding address that directs messages to your existing email inbox or as a fully functional 2GB email account that can be set up with Microsoft Outlook or your other favorite mail client on your computer or smart phone. The more visitors your website gets, the more benefit it provides for you. With any purchase of a LouieBiz Web Presence or Small Site package, we will provide you with a free custom QR Code – a 2D bar code that can be scanned with a smart phone to provide direct access to your new site. QR Codes are perfect for advertising materials, mailings or even just hanging on the wall of your store. They can even be encoded as a virtual business card that allows customers to scan your information directly into their contacts list. Need a QR Code or other promotional artwork or printing services? Contact us today to discuss creating your own custom branding and promotion solutions. Let LouieBiz help your new site show up in search results with search engine submission. Reinforce your brand with your own domain name (e.g. www.Example.com instead of example.LouieBiz.com). Go local and connect with your customer base by letting LouieBiz help your business show up in local search results, maps, and review sites – such as Google Maps, Bing Maps, Yelp, TripAdvisor, and more. Need a social media presence? We can help you get started with that as well! Ready to bring your business into the information age? 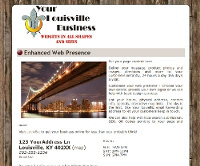 Contact LouieBiz now to get your Louisville, KY business online! Prices for recurring services such as page hosting, sub-domain and email accounts represent yearly charges. Copyright © 2017 WCS All Rights Reserved.